Alan Mynall lives and works near a wood in Oxfordshire. He was born in Warwickshire but moved south to Oxford, in the early eighties, "for the better climate". "Always fascinated by drawing and colour, I studied at art college for two and a half years, in the late sixties, followed by twenty two and a half gap years. "I have drawn with pencil for longer than I can remember, but I do recall getting my first paints. At four and a half years old I was given a set of poster colours for Xmas and the experience of pure colour, pouring out of those little jars, set me on a course for life. I have been making a mess ever since." "HOURS OF BUSINESS. Open most days about 9 or 10. Occasionally as early as 7 but SOMEDAYS as late as 12 or 1. We close about 5.30 or 6, occasionally about 4 or 5 but SOMETIMES as late as 11 or 12. SOME DAYS or AFTERNOONS I'm not here at all, and lately I have been here about all the time, except when I'm somewhere else, but I should be here then too." Perhaps that sheds a little light on his working practice. The 'Ragged Man' series of paintings is notably auto-biographical. These pictures describe moments or episodes in a personal journey. "No one gets far, in this journey of life, without some degree of damage, but the Ragged Man remains open and optimistic." The journey depicted is essentially spiritual; "I may need some of these images explained to me; sometimes my subconscious mind slips things in while I'm not looking. They are all explorations of the attempt to live an authentic life in an often confusing and sometimes apparently hostile world. I do get quite serious sometimes. 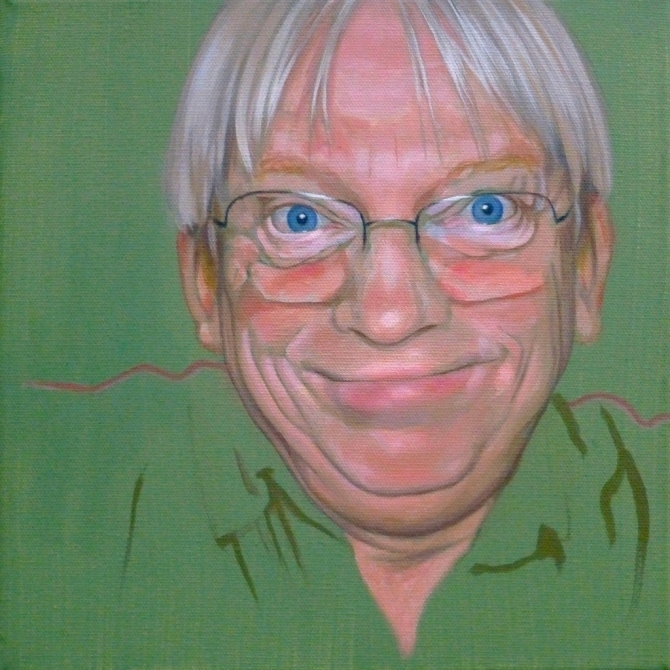 self portrait 2014 oil on canvas 10" x 10"
"I distrust mankind because I reckon I'm one of the best of them, and I know what I'm like." I started being interested in art before I knew what it was called. Visual phenomena – especially those involving colour – always captivated me, and I always wanted to find a way of representing them in order to share them. It was a long time before I realised that not everyone had the same desire to communicate such experiences. It still puzzles me - "People from a planet without flowers would think we must be mad with joy the whole time to have such things about us. ", Iris Murdoch, 1919 – 1999. The first inspiration I was aware of came when I was a baby, seeing different coloured lights in the sky from my pram. In the late 1940s the street where I lived (Hillmorton Road, Rugby, Warwickshire) was the first in the world to be lit by fluorescent tube lamps and British Thompson Houston, who made the lamps, experimented with many different colours, to see which would be the most effective illumination for an urban street. Every hundred yards or so, there was a different colour, so at dusk I saw a succession of spectral colours passing over a luminous blue background. I found this fascinating and hugely stimulating. I think it was the first time I really noticed the world beyond my mother. I didn’t know my experience was of something unusual until my older brother explained to me some years later what had been going on with the street lights. They featured in my dreams for many years. I continue to be fascinated and inspired by all kinds of visual stimuli from the world around me. The human face is an endless source of fascination. "The most entertaining surface on earth is the human face. ", Georg Christoph Lichtenberg, 1742 – 1799. My all-time favourite painter is Pieter Bruegel the elder; he showed me how to include real people in my visual world – and real relationships between those people (viz. ‘The Adoration of the Magi’ in the National Gallery in London http://www.artfund.org/artwork/348/the-adoration-of-the-magi. I am not a religious person but there are real human emotions and communications going on in this picture; consider, for example, what the man with the green headdress is whispering into Joseph’s ear – could it be something like “I can get you a good price for that gold, if you’re interested.” I have had a print of this picture on my wall for many years. Other favourite include David Inshaw http://www.davidinshaw.net/, James Milroy, Rima Staines, and I love the paintings of Margaret Neve http://www.r-h-g.co.uk/artists/view/margaret_neve/84,0,0.html . Inspiration can come from almost anywhere, if I keep my eyes open, though I seldom take much notice of what comes only from my own head – that way madness lies. I started with pencil and paper and that is still the medium I am most comfortable with. I also like drawing in ink. However these have never given me the ability to explore my fascination with colour; for this I mostly like to use oil paint – the most versatile painting medium. Watercolour is wonderful but so unforgiving it can be very frustrating; I wish I could have been tutored by Alfred William Hunt – his watercolour landscapes are technically fabulous http://goldenagepaintings.blogspot.com/2010/05/alfred-william-hunt-finchale-priory.html . I have experimented with digital imaging and would like to do more with Brushes App if I had the time. I have tried to learn as much as I can about the traditional oil painting techniques, as perfected by the Van Eyck brothers about six hundred years ago. These have produced the most permanent paintings – besides frescos – and permanence has always been important to me. I can’t see the point in putting effort and soul into something if it’s not going to last. I realise I am not up with contemporary thought in this. I am not sure what the people who made Stonehenge were trying to say to me, but I’m glad they took the trouble to make it out of stone rather than wood, or I might never have known they tried. I use photography a lot, and digital imaging, but I find myself relying on mechanical imaging less these days. All techniques and tools are a means to an end. ARS EST CELARE ARTEM. As for formal art education, I did a one year pre-diploma course in art and design at Rugby School of Art, followed by a Dip AD course at the West of England School of Art, Bristol, in the late 1960s. I dropped out of the diploma course halfway through, due to disillusionment and the fact that it was 1968 and a very good time to drop out. I learned very little of use to my art at college. I always wanted to paint things to look like things, and that was not taught by colleges then. I didn’t pick up a brush for some years. It was by trying to find my feet in the real world, and meeting practicing artists, that I eventually – by the mid-seventies - reconnected with my love of painting and my need to follow my own vision. 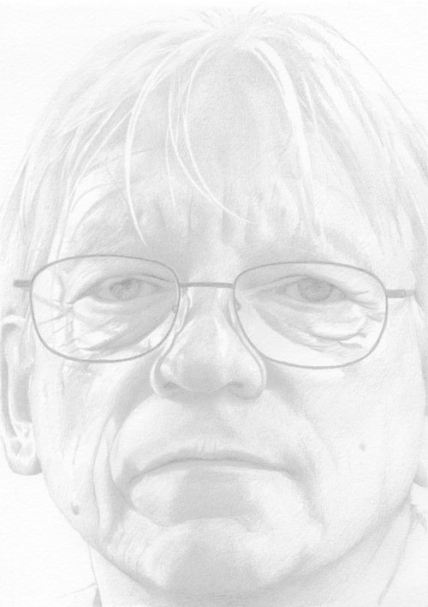 Alan Mynall has been an active member of the Oxford Art Society for over twenty years. Many of his paintings are in private collections in Britain, France, Germany, and Switzerland, as well as in Canada and the United States. He is also represented in at least one international corporate collection. He has bought most of his artist materials for the last thirty years from Broad Canvas, Broad Street Oxford. Alan Mynall is a Quaker. He has not recently done a hand-stand, but would like to think he still could. His wife, Sue Mynall, is an accomplished and published illustrator. Alan is a friend of Bill W.